p$$st brand butter at Kroger $2.69 here. Notice the sugar in the ad. I bought it for $0.99 now $1.59. Grocery competition is fierce here, so many stores. Wonder whats up with butter prices. Slowly easing up, no sales here. You holding the clicker down or something? Get your headphones/earbuds and listen to YT music. Elvis singing Unchained Melody is good but not as good as the Righteous Brothers. - Picked tomatoes, lots of tomatoes ( yes, I am back from vacation.... Is driving around the western states a prep ? ) , and alot of brocolli -- pounds. But, bunnies ate the new brocolli plants and the sugar snap pea starts while I was gone. - Picked apples and canned them while visiting family out of state. Gravensteins from an ancient, large, heritage tree in Coastal Oregon. We canned apple sauce, about 36 pints in small batches of 6 pints each, I brought home one flat of 12, done plain. All the rest was done with brown sugar, fresh lemon juice and zest, cardamon and cinnamon. We also picked blackberries, ate the one pie and put another pies worth in the freezer for their thanksgiving use. - Tested out my white gas 2 burner stove and lantern that I keep for prep ( while away from home already. Note to others: pull things out every year or so to check condition before you need them.....) Tested out the wool blanket that lives in the car trunk, worked great for smothering a small fire, and does seem to be 100% wool as advertised, so no harm done ( thanks Old Grouch surplus !) Bought a propane camp stove in Nevada. Now I have more fuel choices and camping options. The gas lantern worked great. - Made use of the rain poncho that usually lives in the trunk, an IKEA one. Lightweight for daypack usages, long, but the hood is a bit too big for me, hard to keep from covering my eyes, so good to know and make adjustments in case I need it for an emergency. It Rains in the summer out there, afternoon thunderstorms. We had heard of this, so were prepared, we even packed proper raincoats, but still startled by the buckets that come down at once in Arizona and Utah. This was a good reminder of what it is like to hike uphill in a deluge, on vacation of course, we loved it as a novelty, short with a hot meal at a warm resteraunt waiting, but good prep for when it can be more serious. I also slept in a tent for 6 nights, mostly in 1 night increments, lots of practice making and breaking camp, and the on the ground sleeping on a very thin pad. Night temps fluctuated from Nevada where you cant use the sleeping bag or PJ's at all, and the camp water tap delivers water almost hot enough to make tea, to Northern Wyoming where there is ice coating the picnic table. Just beautiful all over, a slice from south to north ( we stopped and turned west at Missoula Montana). While we had to go to yet *another* clinic (wife) apt, we stopped at Aldi's *again* and stocked up with canned goods again. Our house purchase just about to be finished, about 20 days to wait for the official property paperwork. Canning quite a bit with my wife. Yellow plum jam tonight. Sounds great on all counts. Do you have a lot of food storage to move?? Not that much. We're reducing the supplies by eating some of the oldest cans lately. Luckily we can keep whatever we don't want to move right here. We're not leaving the current place forever, just making it my family's holiday place again. We will surely keep some supplies here, as we always did. Congrats on the house ! Jam sounds good too. 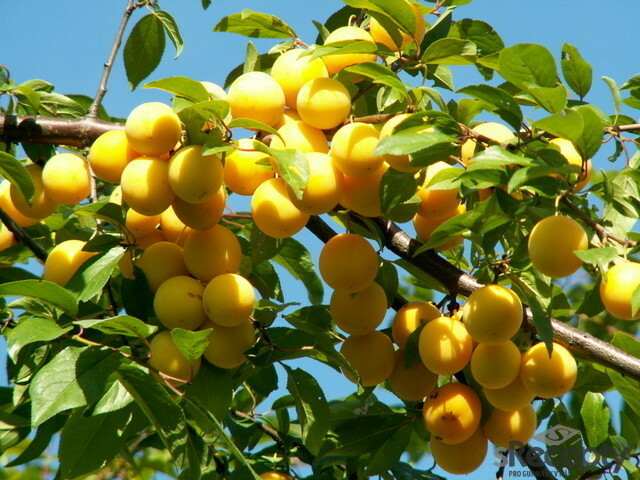 I'll be shipping some seeds of these yellow plums (we call them pinhead-plums here) to a friend in Canada. Last two years the fruit was really bad, as it was too dry weather and the plums fell before they were ripe. This year I made sure to collect enough seeds. If anyone is interested, I can send some more. Takes couple years before the tree starts to bear fruits of course, but once it does, the harvest is usually huge. The tree requires no care, maybe some warer when it's very small. Wild yellow plum? Would you have a picture of them? I'll find some picture for you. Likely won't be able to take one, as most of the fruit is either harvested or fallen. I believe the correct name would be Mirabelle plum. Thank you. Those are nice sized. I'll research a bit to see if I can grow those here. I think you should have no problem, they are very easy to grow quite everywhere. My place is quite cold and we still get nice harvests, unless it's a very dry year. We also have red ones, but I think the yellow taste much better. More juicy, too. The only problem with these is that you need to process them somehow, as they spoil quite quickly. Jam or booze seem to be the best ways you can utillize them. Went to the forest with my wife to look for mushrooms. It's been too dry lately to expect any large mushroom harvest, but we found some after all. Diced some for stew and sliced the nicest ones for dehydrating. Also dehydrated some common blue plums eralier this week. Every day we pick couple handfuls of walnuts, it's a race between us and squirrels who finds them first. They are winning most of the time. I've just finished an order of two long hand-forged chains today. Good practice in forge-welding, not so good earning, but certainly a good skill to have. Also finished some knife blades today, will make handles over the weekend. neighbor loaned us his hydrolic wood splitter, so we split some wood today, on the turtle speed, we had to pull rounds of wood out of the vines and get them uphill first, this tree came down in a storm a couple years ago, due to being weakened by this grub, and one of the rounds was full of them, they are hug and gross, scroll down to the grub photo, and they are fat, like a ridged, albino finger. I threw a few to the chickens, but did not have time to get them all. http://www.bentler.us/eastern-washington/animals/insects/beetles/california-prionus-beetle.aspx My youngest stacked what we did in the wood room, figured why throw it in a pile, especilaly since we are on turtle speed, when we can set it in a wheel barrow and put away as we go.... spent about 3 hours, did around 11 rounds of the stuff we drug up, and some other rounds already up by the road. Got my chipotle peppers finished dried in the oven, then ground and jarred. Much stronger smell than store bought. Haven't taste tested yet. Canned a quantity of carrots that were just sitting in the frig doing nothing. Got 9 pints. on the walnuts and chipotles there Steve. Sausage egg and cheese biscuits that dog and I shared for breakfast...she likes just a bit of Louisiana Hot Sauce on hers for flavor...lots of rain in this weekends forecast...Brandi is already enjoying her second nap and it is only 6:30 AM...she shows me how important it is to pace yourself in life.